Are you trying to eat better? Mix up your everyday lunch a bit? Add more greens? Try new things? Cut down on process-y foods? 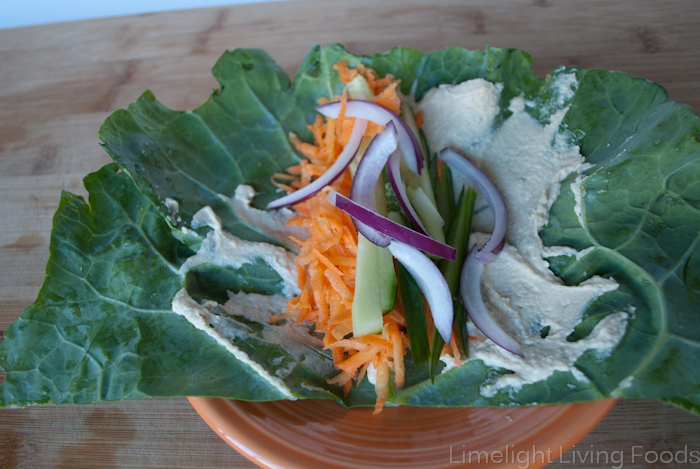 Have you ever tried using big leafy greens for wraps? Forget the tortilla shell, pita boat, and other grainy-ness modes of wrap wonder. Try some greens! It is the best discovery once you make the connection. Greens I like to use: big leaves of swiss chard, butterhead lettuce (aka Boston or Bibb), romaine, green/red leaf lettuce and collards. 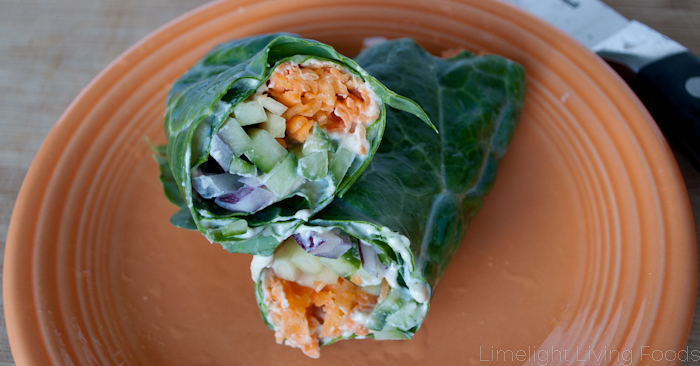 Today, I’ll show you pics from my collard wrap. Super easy. The bigger the leaves the better. 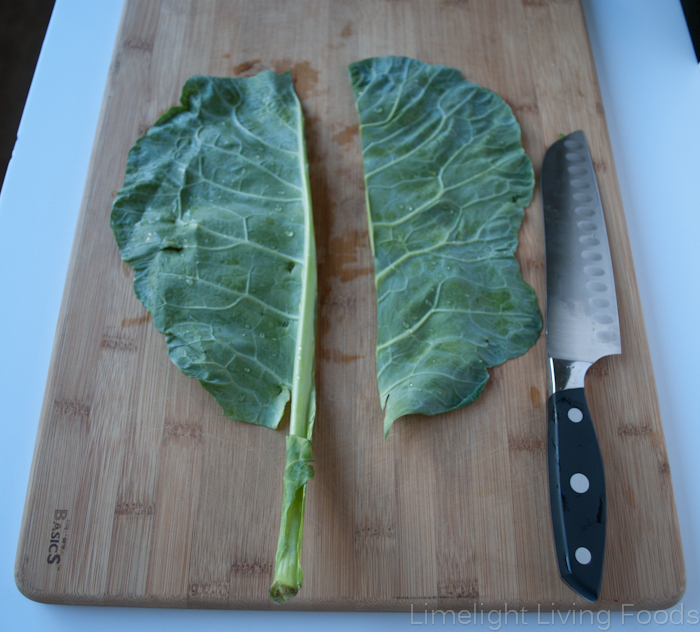 To start, cut along the stem line to remove each leaf. These will be your wraps. I’ve also tried removing just the bottom 2″ – this works too. Just for perspective, my cutting board pictured below is 20″x14″. This was one BIG leaf! Next take your ingredients, I used homemade hummus, freshly shredded carrots, thinly sliced cucumbers, and thinly sliced red onion. I also love guacamole as a filler/dressing along with whatever veggies you have on hand. Mix it up! 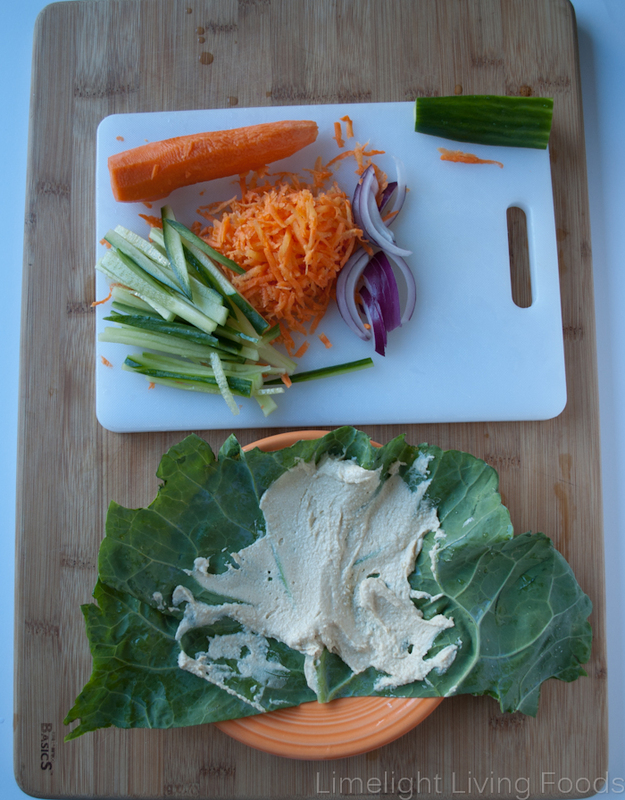 Spread hummus on the collard leaf and add your veggies – in the center or evenly spread across the leaf. Now, roll it up and cut in half if you prefer! Easy. Takes minutes. Some of the ingredients could even be prepped a few days in advance to save time in the mornings or on your lunch break. That looks SO GOOD!!! Thanks for sharing!! Definitely going to try this! Well I have made these four times now in different ways each time – LOVE!! YUM!! Lentil dip, hummus, black bean dip… Thanks again for sharing the idea! Yay!! I love it that you are loving it 😀 Lentil and black bean dips both sound wonderful. I will have to try! Mmmm black bean dip with guacamole!